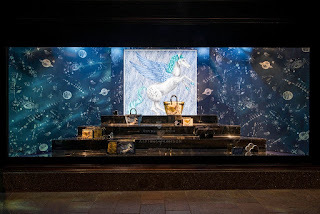 Here's a snapshot of the latest collaboration between Aspinal and the renowned graphic artist Emma J. Shipley, produced by www.millingtonassociates.com The walls of the window have been printed and form the night sky with twinkling light, at the centre of which is a beautifully illustrated Pegasus. 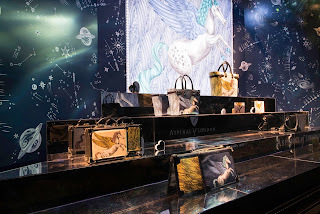 The product itself has been placed on a stunning mirrored showcase plinth. 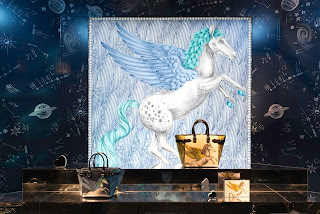 This scheme forms part of Made with Love and Precision campaign currently at Harrods and of course is a fantastic example of super luxury at its finest.